Barton is a village and civil parish in the South Cambridgeshire district of Cambridgeshire, England. It is about 4 miles (6.4 km) south-west of Cambridge, near junction 12 of the M11 motorway. The Roman road Akeman Street may have passed through the village. 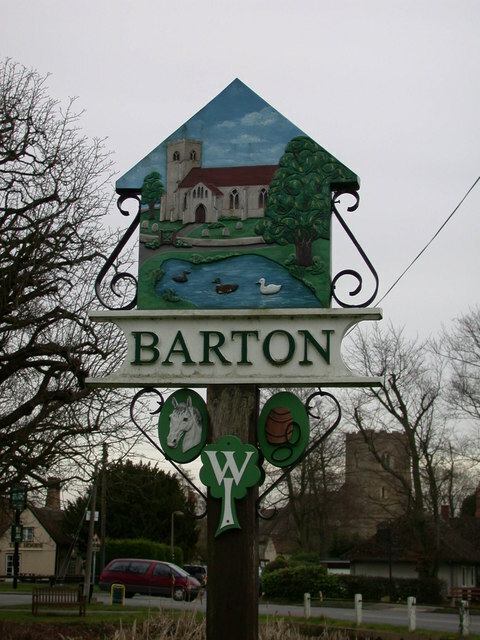 Barton, Old English Bartone, is mentioned in the Domesday Book. At that time, 1086, Robert, Count of Mortain, Humphrey from Guy de Raimbeaucourt, and William of Keynes were listed as Barton land-owners. Between the High Street and A603 Wimpole Road lies the village's recreation ground, with a full size football pitch, tennis courts, half pipe, children's play area, pavilion, bowls club, car park, dog walks, and rough ground for general recreation. A village hall neighbours the school.